You list Calvin College, Grand Rapids, MI, as being contemplative, formation. Please give me evidence, examples of this, also any emergent info, too on them. ASAP, please. 2015 article talking about how Calvin College is incorporating Taize Worship: http://www.calvin.edu/chimes/2015/04/30/world-language-chapels-provide-wider-worship-opportunities (Taize is a form of contemplative worship and meditative practices developed at the interspiritual Taize community in France: http://www.lighthousetrailsresearch.com/taize.htm). Another example of CC using Taize (this one in one of their Chapel services): http://www.calvin.edu/offices-services/campus-ministries/worship/archives/?pageNumber=103&numberToShow=10. Also in the example above, it shows contemplative/emerging figure Michael Gungor as a chapel leader this year. Gungor is a strong contemplative/emerging advocate: http://www.lighthousetrailsresearch.com/blog/?p=9848. In this article on Gungor, we show his views rejecting the biblical account of creation: http://www.lighthousetrailsresearch.com/blog/?p=15886. Here you can see a Calvin College “Sabbath” exercise, which was inspired by emergent Shane Claiborne: http://www.calvin.edu/dotAsset/381ecf55-8803-4f21-b6f3-5ac6c10aef97.pdf. In 2014, the Calvin Institute of Christian Worship (part of Calvin College) presented an event by Dr. Michael Higgins exalting contemplative Catholics Thomas Merton and Henri Nouwen. http://worship.calvin.edu/news-events/events/roots-of-influence-thomas-merton-and-henri-nouwen-a-presentation-by-dr-michael-w-higgins/ Higgins calls Merton and Nouwen, “two of the 20th century’s most important and articulate Christian voices.” This event was held at the Catholic Information Center and was sponsored in part by Calvin Institute of Christian Worship. 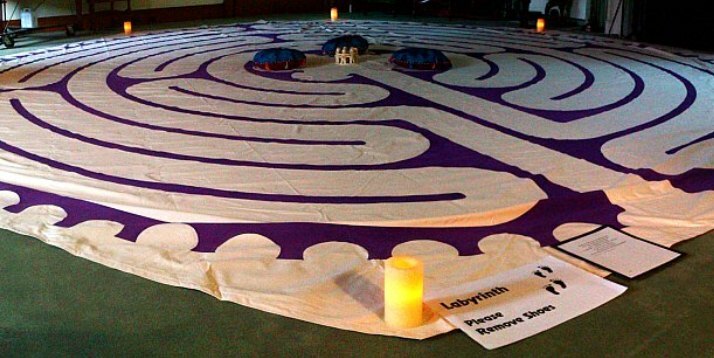 A prayer Labyrinth in March 2015 in the chapel multi-purpose room: https://www.calvin.edu/calendar/event.html?id=dde727e6-8f7d-4497-8bc2-d34020e977bf. You can read more about labyrinths here: http://www.lighthousetrailsresearch.com/labyrinth.htm. In a 2013 chapel service, students were taught how to do lectio divina, a contemplative practice: http://www.calvin.edu/chimes/2013/10/19/chapel-schedule-oct-21-25/. Here you can read a good article describing what lectio divina is: http://www.lighthousetrailsresearch.com/blog/?p=10887. To show the “fruit” of the contemplative spirituality that Calvin College is embracing, see this 2016 interfaith conference: http://www.calvin.edu/calendar/event.html?id=e0f5d8c9-dcb7-4a1e-ae70-796233a6925b. At Calvin’s Henry Institute, an interesting list of speakers including anti-Israel Jim Wallis and Stephen Sizer: http://henry.calvin.edu/news-events/past-events.html. See our articles on both these men at our site. Also watch this video: http://www.lighthousetrailsresearch.com/blog/?p=16058. The Christian Classics Ethereal Library is located on the Calvin campus, and to show its connection to the college, many of the Board members are Calvin College faculty and staff: http://www.ccel.org/info/structure. The CCEL is on the Lighthouse Trails top organizations bringing contemplative into the church. They even promote Emanuel Swedenborg, an occult influenced figure: http://www.lighthousetrailsresearch.com/blog/?p=5618. In this 2011 course, From Worldview to Worship, one of the textbooks is a socialist promoting book titled Desiring the Kingdom. http://www.calvin.edu/~jks4/fromworldviewtoworshipsyllabus.pdf. You can read excerpts of that book on Amazon. The list above covers everything from contemplative meditation, emergent theologies, interfaith connections, Islam, Israel, the occult and socialism. And finally, the homosexual issue. Just type in LGBT in the Calvin College search engine, and you will have a day’s worth of reading: http://search.calvin.edu/search/. You can also check out their textbooks here: http://www.bkstr.com/calvinstore/shop/books/textbooks-and-course-materials. I hope this helps. This is just the tip of the iceberg for Calvin College. Thank you for covering this. I am a graduate and no longer support Calvin.